Near Carcassone. Private situation. 4-bedroom, 3 bathrooms, fully equipped. Azille is a Cathare village with historic buildings, but is complete with modern amenities: shops, restaurants, bar, tennis courts, a nearby lake for water sports etc. Wine tours and visiting Caves are popular pastimes, and there are local markets in Azille and the nearby villages. Kilima is approached via a gated drive leading into the landscaped garden. A luxury property, Kilima is perfect for a memorable family holiday. Set amid Azille's vineyards and olive groves, Kilima benefits from breathtaking views across the Black Mountains and the Pyrenees. Yet, along with the proximity to the vineyards of Minervois, the medieval city of Carcassonne, a world heritage site, is a short drive away, and the clean, uncrowded , beaches of Gruissan with wind-surfing, jet-skis and sailing available. Narbonne a similar distance away has a picturesque town centre with the Canal-du-Midi, markets and cosmopolitan restaurants. The 11 x 5m private pool is a much loved feature of the property, particularly in the summer when the local temperature hovers around 30`C! There are pool lights for night-time dips. It is overlooked by a shaded terrace, ideal for al fresco dining. The villa is decorated to an unforgettably luxurious standard making for a truly relaxing holiday. The villa is equipped with Wi-Fi internet and telephone, Sonos, X-Box 360, TV, Blu-Ray DVD with cinema style surround sound system and a selection of DVDs. There is a satellite dish to receive English channels. Table football, pool table, table tennis, bikes add activities for those of all tastes. Kilima truly can cater for everybody's needs and desires. The very large lounge/ dining room/ kitchen is the hub of the house. Cooking and dining become a truly family endeavour. There is a Gas Barbecue on the covered terrace. The kitchen is comprehensively equipped: the standard American fridge-freezer/ ceramic hob/ oven/ dishwasher are augmented by an array of gadgets from smoothie maker to fondue set. The Games room also houses the washing-machine and tumble-dryer. There is a travel cot and high-chair available. The property is also suitable for wheelchair-users, being mostly on one level. 2 of the bedrooms have king-size beds, and en-suite bathrooms. The other 2 bedrooms have twin beds that can be joined to make a super-king-size bed. For that extra sense of security, the villa is equipped with an easy to operate security alarm, and electric roller shutters to the windows. All bathrooms are fully tiled with spacious walk-in showers, heated towel rails & substantial vanity units. The master bedroom bathroom includes a bath in addition. Comprehensively equipped - everything you could require for culinary excellence! Large selection of fiction and non-fiction. Enclosed large landscaped garden. Planted with fruit trees, including almond, fig and cherry. Fresh herbs on banks. Olive trees line the drive, and border the property. Gates at the bottom of drive. Opening from master-bedroom via full-width patio doors. Available at Puicheric... including white-water rafting. In Azille, accessed via the Mairie's office in the village. With bubble-cover to reduce overnight cooling. The kitchen, lounge and dining areas are open plan, with patio doors extending across the front of the property and high beamed ceilings. The kitchen is equipped to an excellent standard with all electrical appliances, including an American style fridge-freezer. A breakfast bar seating 4 people separates the kitchen and dining areas. The lounge offers an open log fire and is luxuriously furnished with mocha leather sofas, coffee tables and a large TV with DVD player and cinema style surround sound. There are 2 i-Pod docks and a Sonos The private 11x5m pool is alarmed and equipped with underwater lighting. The villa benefits from a covered terrace with a large gas BBQ and a wrought iron table with seating for eight; the terrace leads to the pool decking on which there are 8 sun loungers. The games room is equipped with a pool table, table football, badminton and gym equipment; the ping pong table is outside. There is an extensive collection of books, DVDs and board games available. Didn't travel to far afield during our week but well worth a trip to Gruissan where we enjoyed some excellent cocktails down at beach and dinner at the harbour. Avoid Carcassonne in August if you don't like crowds. Beautiful views in a great location. A lovely villa with all the mod cons, there is every gizmo and gadget in the kitchen you could possibly need. The photos do not do the property justice it has oodles of space and is tastefully decorated. 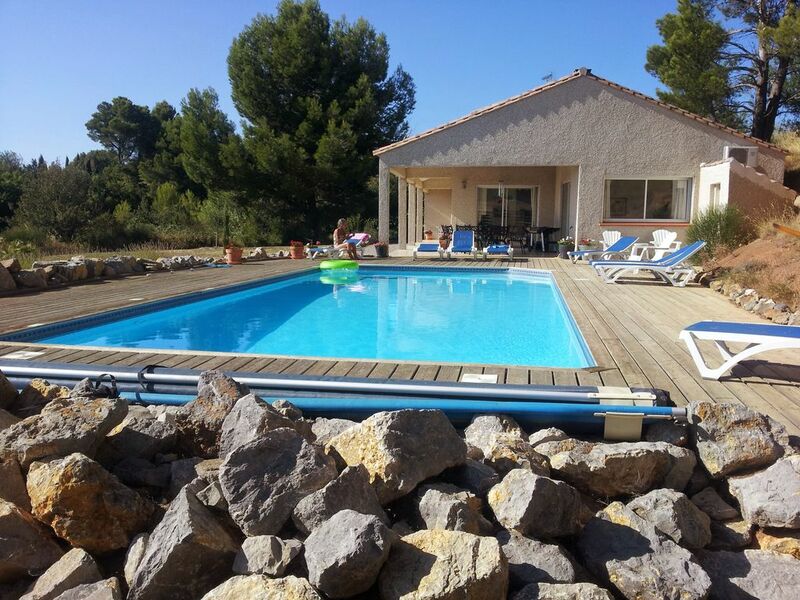 Its in an excellent location, perfect for exploring the area including the Med, Carcassonne, Narbonne etc.. Its a shame we didn't book for 2 weeks! Spent a wonderful week at this lovely villa. It was incredibly well equipped, clean and with stunning views. If I could find any fault, and it is very hard to do, it would be that the pool was a tad cold, but as I was the only one in my party to think so, I really am stretching it! The owners were very helpful and prompt with any queries, and my deposit was returned quickly with no fuss. I would definitely recommend this villa and hope to go back soon! Just thought we would drop you a quick e-mail and say thanks very much for a fantastic stay at Kilima. The standard of accommodation was superb! The house was fitted out with just about everything you could ever wish for. We all had a fantastic time and we were very lucky with the sunshine as well. The little village of Azille was lovely and the wine co-operative selling very drinkable Red and Rose at 1 Euro a litre could not be beaten!!! The views from the villa were fabulous and i will miss them very much. We would have no hesitation in recommending Kilima and would very happily stay again if we return to that part of France. Th property was excellent well appointed and enjoyed a fine aspect with views across the valley. The listed description was accurate but unfortunately a fire had disconnected the property form the Internet. I am sur now that France a telecom has resolved that issue. The property was clean and well maintained. I would commend this pro pry to a friend and relative. We enjoyed ourselves enormously. We had a very frustrating time with SFR and our difficulties with the internet! A beautiful village, Azille is located in the heart of the Minervois wine growing region of the South of France. Situated in an elevated position, Kilima benefits from magnificent views overlooking vineyards, olive groves and extending as far as the Pyrenees. The village itself hosts a number of wine caves selling superb wines at very attractive prices and almost all offering complementary degustations! Many activities take place during the year including outdoor markets, flea markets, the annual Feria - a testament to the local Spanish influence, and a music festival in July. Azille is set close to the Canal du Midi, offering opportunities for waterside walks and bike rides, not to mention leisurely canal cruises for the aspiring sailor! A less crowded alternative to the coast, Lac Jouarres, set but a mile from the village, offers family fun throughout the summer. Opportunities to swim, wind-surf, sail, fish or merely laze on the beach area make this a much loved venue on sunny days! A full linen service is included in the price - bed sheets/ duvets, towels, beach-towels, tea-towels. should you require a change of linen, there will be an added charge of 10 euros per person. A midweek clean can be arranged at a charge of 20 euros per hour. Welcome packs are available on request. Utilities included. To book a stay at Kilima please contact us either by e-mail or phone.